The Rhine is one of Europe’s major rivers, and the prettiest part of it cuts through Germany. In a short stretch of the river between Frankfurt and Cologne, there are a ton of castles, charming small towns to explore, big cities to enjoy, and plenty of wine. This area can be explored easily by train, car, and of course by boat. If you want a week where you can just revel in castles every day, this is the region for you. 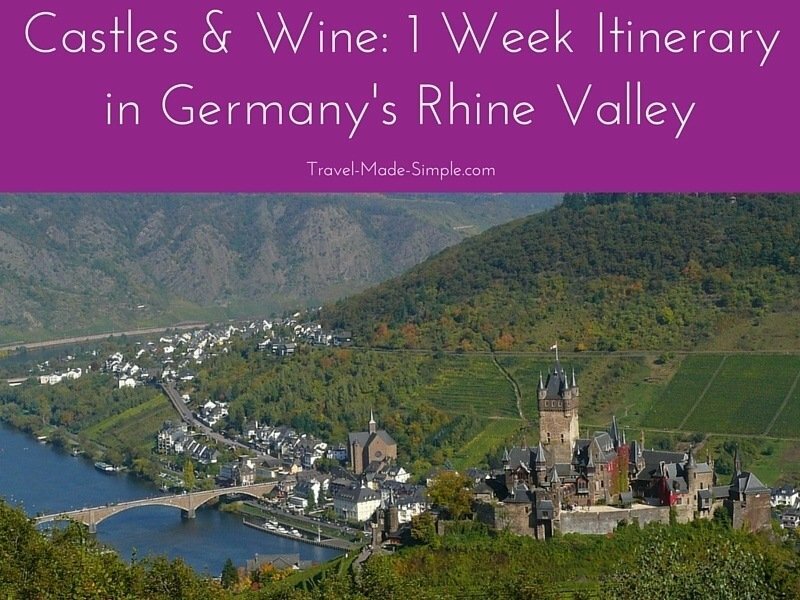 Here’s our 1 week itinerary in the Rhine Valley to help you make the most of your trip. In general the best time to visit is between April and October, which is when the boats run. One of the main companies running boat cruises that do the castle stretch on the Rhine do not run in the winter. Check here for their exact schedule. Weather in Germany can be changing and blustery in the spring, but summer days are warm and long. Summer also brings the tourists in herds, making longer lines and more crowded towns. Late summer and fall is the time for wine festivals. Winter can be cold and many attractions might be closed or on limited times, though Christmas time can be fun in the cities with Christmas markets. Frankfurt is a major airport and should have flights to just about anywhere you are coming from or going to. Arriving by train, either Frankfurt or Cologne have major stations, although Koblenz is a stop on the main train lines as well. Book trains in Germany and all over Europe using Omio (formerly GoEuro). It’s straightforward and all in English, and it can even show you bus and flight options. 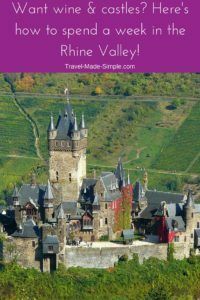 The Rhine Valley is not a huge region, so it makes a lot of sense to base yourself in one city and take trips out to explore different places. While there are a few larger towns, the real sights are spread along the river. This means several of your days will be spent heading out from your base to see things. Organize your day trips as you see fit, but also make sure you leave a day to explore your base as well. Which city you choose for your base will depend on what transport you have and what kind of place you enjoy. Very central, but smallish at 110,000 population. Even still, it is an old city with plenty of history and a transport hub for the region, so finding hotels shouldn’t be hard. By train, Koblenz is 2 hours from Frankfurt’s main station, an hour from Cologne, and an hour and a half from Trier. It is also the top of the best stretch of both river cruise routes (Moselle and Rhine) to see castles. 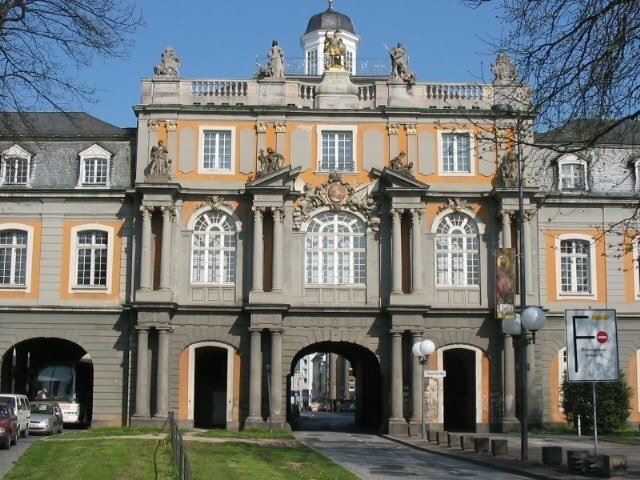 If you are more of a city person and the idea of a week in Koblenz bothers you, check out Bonn. The former capital of West Germany, Bonn is also the home of a university and plenty of museums. It is south of Cologne and only 30 minutes north of Koblenz on the train. It makes a fine base for the region, with Trier still in day trip range at a bit over 2 hours by train. Being a bit further away means having slightly longer days on the trains. There are plenty of smaller towns on the river if you crave that, but if you plan to do a lot of exploring and don’t have a car, check train schedules before you book a place. 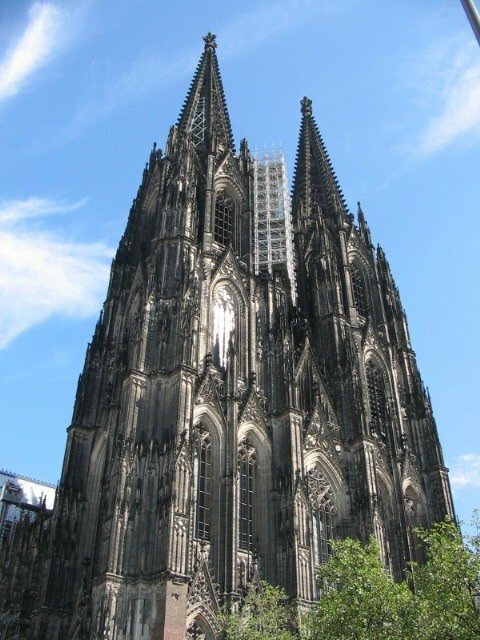 If you absolutely need a big city as a base, Cologne is still only an hour from Koblenz, but you are adding that hour on both ends of day trips plus time to get to the station from your hotel. This itinerary is written with the idea that you will not need a car to do it. If you do have a car, do some research ahead of time as to where you can park, especially in the summer and if you are going to a smaller town. Check out this post on using the Deutsche Bahn (German Rail) system. Here is the Deutsche Bahn site in English. For the trains toward Trier and along the Rhine, look into a day ticket for Rhineland-Pfalz. These allow a group to travel cheaply for a whole day, but only on the regional trains and local buses. (Don’t get on a white IC or ICE train with that ticket.) Bonn and Cologne are in a different state, so you will need a different type of ticket. This is a general itinerary and definitely should be used as a guide and change to fit your desires. As written it is pretty chock full of activities, but only you can judge how much you want to take on for your vacation. Don’t expect to be able to see everything, and be ok with a day of just relaxing by the river if that is what you want to do. Take a train to Bingen or Rudesheim and make your way to the docks. The best part of the river is from Bingen/Rudesheim downstream to Koblenz. The KD line is the biggest that run the trips. Check their schedule here. They have a hop-on-hop-off style ticket that lets you get off and explore various towns. This is a good option if you have all day. Just make sure you know the schedules so you don’t get stuck. If you have plenty of time in the week, you can also use the cruise to relax and just survey out the castles you want to come back to. You can book your cruise tickets ahead of time and have them printed out before you even get there. Trier is a town on the Moselle river near Germany’s border with Luxembourg. It was once a Roman outpost and still has a mostly intact Roman gate called the Porta Negra. 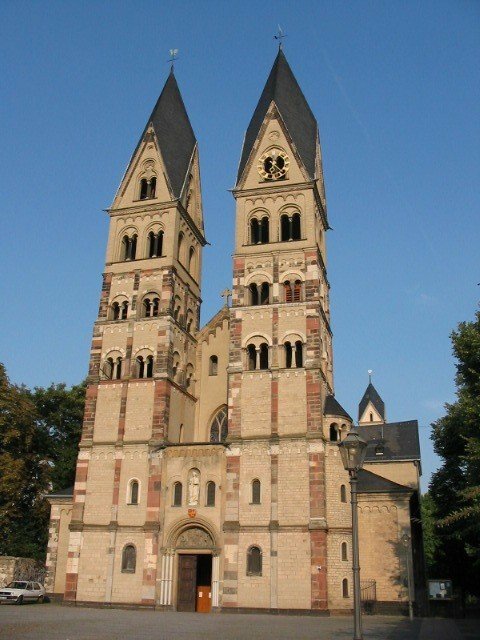 Other sights in Trier include Roman baths, a cathedral, amphitheater ruins, and general German charm. You can read more on the Trier city site. Directly out of the train station, walk toward the massive black gate left by the Romans. Find the nearby tourism office to plan the rest of your day among the Roman history. Even if your base is not in Koblenz, it is definitely a town worth exploring. Koblenz sits where the Moselle river flows into the Rhine. It is an old city with history in the Roman era as well as the Middle Ages. Ehrenbreitstein fortress sits on the opposite side of the river from the main part of Koblenz. It gives a great panorama view of the region and the city. It is the home of several museums and a youth hostel. You can reach the fortress from downtown via a cable car system that reaches across the river, which is quite unique. There are combo tickets for the cable car and castle together. There are several churches in Koblenz, like the Liebfrauenkirche in the center and the four towered Basilica of St Castor, which is right next to the cable car. Koblenz was the home of one of the Electors of the Holy Roman Empire, and that palace is still there if you fancy that kind of thing. Read more about food culture in Germany here. The Moselle Valley is one of Germany’s wine growing centers with vineyards dotting the hills pumping out plenty of Riesling. Read about festivals, hiking/biking trails, and more information about the region on the region’s site. Here is another list of festivals. If you like wine and cycling, you could easily spend your entire week in the region. Check out this 8 day bike and boat tour for a unique experience on the Moselle River. Numerous towns along the Moselle can be interesting stops to explore a bit of wine and the river. Cochem is one of the more well known, with a cable car and requisite looming castle. With its well known status, there can often be a lot of people around in the summer and during wine festivals. 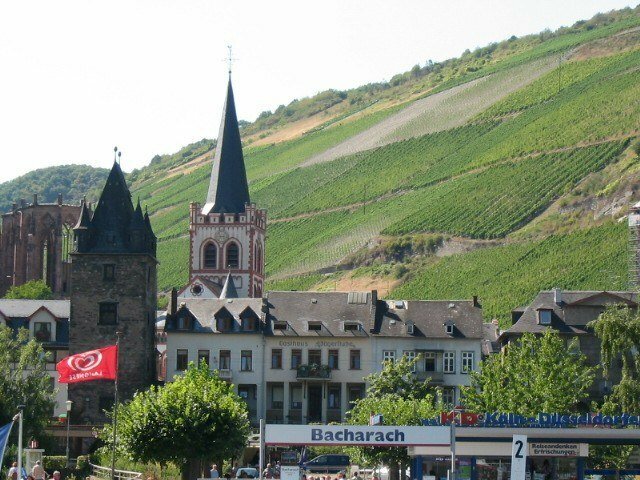 There are wineries like this one in Cochem that offer tastings and tours. Traben-Trarbach, Bernkastel-Kues, and Leiwen are just a few of the many other towns along the river. Though not on the train routes, they are served by buses. There are also river cruises if you want a more relaxing way of seeing things. There are plenty of castles that you can visit in the region. Here is a selection. Pick a few and check the transport links as well as your own energy level of how many you feel willing to hike to. There is no shame in sitting by the river with a beer or wine admiring castles from below either. This is Germany. These two castles are down the Rhine, but accessible via public transport. This is the castle that looks like a boat in the middle of the river, and it was built as a massive toll booth. It is near the town of Kaub, which has a ferry that goes to the island. These two towns huddle in the shadow of the Lorelei cliffs. This was once a very dangerous part of the river and there is a well know German poem about it. The poem claims a siren on that cliff lures ships to their doom on the rocks. If you are up for a hike, there is a statue on top of the cliff on the St Goarshausen side. Protecting the area is the pretty cool looking Burg Katz (not open to the public). 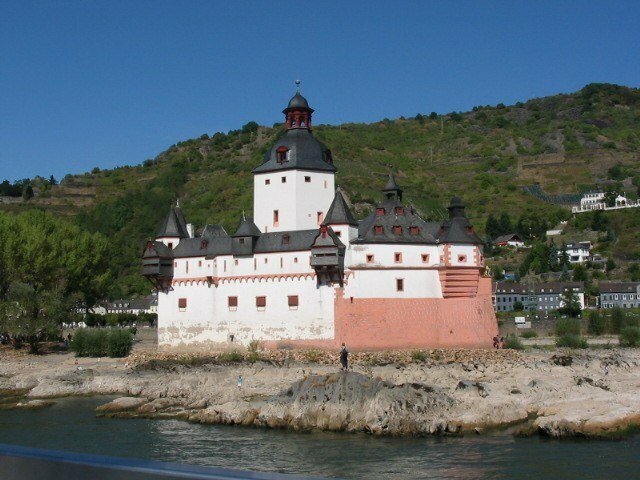 These two castles are down the Rhine, but only a few kilometers from Koblenz. Stolzenfels is a castle from the middle ages that was rebuilt in the 1800s and owned by the city of Koblenz. Take Bus-Line 650 from the Koblenz station toward Boppard. Get off at the Stolzenfels-Schlossweg station and follow the signs to hike to the castle. Across the river from Stolzenfels is the town of Lahnstein. Above Lahnstein is castle Lahneck. Info on visits on their site. Lahnstein is connected to Koblenz by hourly trains with the ride lasting only 15 minutes. Burg Eltz is on the Moselle river about 30 minutes from Koblenz. This castle is one of the best examples of that “medieval looking castle” that you probably think of when you think Castle. Here’s the castle’s website for information on tours, prices, and exact directions. It is open open from March to November. There are several ways to get up to the castle, but all of them involve some amount of walking. There is a bus on weekends and holidays in the summer. The train station is about 90 minutes on foot and of course if you have a car, there is parking. More details here. For a departure from the rest of the castle heavy week, take a day to explore the large city of Cologne. Only an hour from Koblenz by train, it is almost a different world. The moment you step out of the train station and in the presence of the enormous cathedral, you will understand. The massive cathedral is so big that getting a picture of it all at once is a challenge, though you can climb it and see the city from above. You can find more info about the climb here. Cologne is a big city that offers everything you’d expect from a city. There is shopping and plenty of restaurants, museums, churches, and cafes to sit in, look at, and enjoy. If chocolate is your thing, you might enjoy the chocolate museum there. Again, even if Bonn is not your base, it is worth a look. As the former capital of West Germany and a prominent city even before that, there is a lot of culture crammed into a small city. There are plenty of museums and gardens if that is your thing. If you STILL haven’t gotten enough of castles, Castle Drachenburg is up a funicular railway from the town of Konigswinter only a short ride from the Bonn-Beuel train station (on the east side of the river.) The views of the valley are spectacular. If you happen to be a WWII buff, the town of Remagen lies just south of Bonn, about 20 minutes away on the train, and is the site of a famous battle and shown in the 1969 movie The Bridge at Remagen. There is a museum in the remains of the bridge. Do you have more than one week? If you have more than a week, you can either spread this itinerary out or explore more smaller towns. It depends on how many days you want to spend exploring the Rhine Valley area or if you want to go further afield. Mainz and Weisbaden are south near Frankfurt on opposite sides of the Rhein. Heidelberg is a bit farther south, but is definitely top of the “classic” Germany sites and a good entry to the Black Forest beyond. Speyer is on the Rhein just beyond Heidelberg / Mannheim with a large historic cathedral and a transportation (cars and planes) museum. Did we leave anything out? 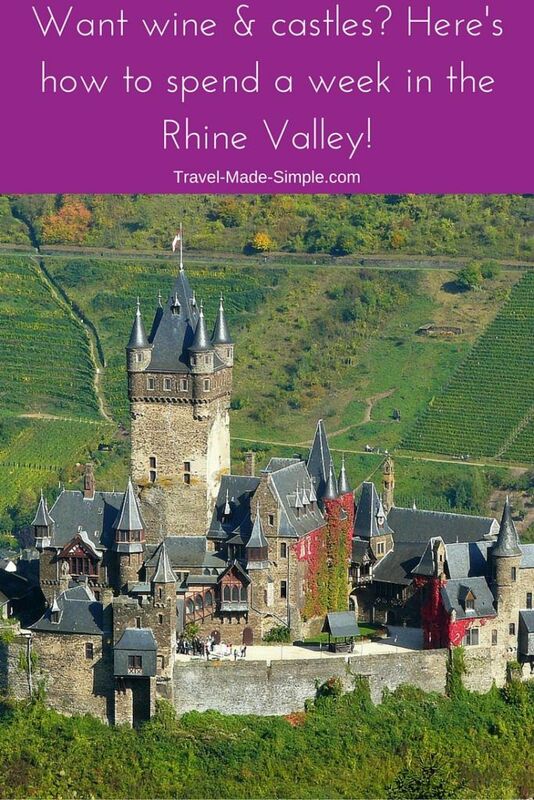 What would you include on a 1 week itinerary in the Rhine Valley?